That is not a Parks Canada Park Warden dress uniform. It is a member of Environment Canada Enforcement. They do not patrol national parks as a part of their normal duties. On the tunic you can see a breast badge. Only Environment Canada enforcement wears a breast badge. fortsmithman wrote: That is not a Parks Canada Park Warden dress uniform. It is a member of Environment Canada Enforcement. They do not patrol national parks as a part of their normal duties. On the tunic you can see a breast badge. Only Environment Canada enforcement wears a breast badge. That's the uniform I've seen the wardens wear. fortsmithman wrote: That's the uniform I've seen the wardens wear. Did you see the warden in question during some sort of formal event or acting as a tour guide ? The town I live in is HQ for Wood Buffalo National Park. My late grandfather was a warden at WBNP from the late 1940s to the late 1950s after which he became a territorial game officer. Here in town I do see the wardens in the dress uniform on Remembrance Day, and Canada Day except they didn't wear a Sam Browne belt with the tunic. Also Im not sure if they had collar dogs on their tunic. At WBNP the wardens are not tour guides. Tours are given by the lovely people at Visitor Services. 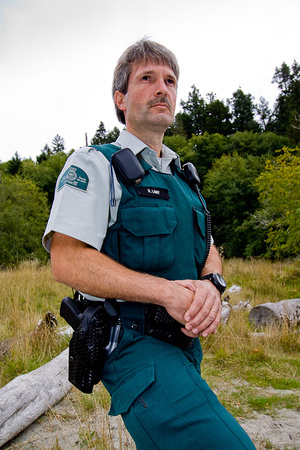 I just looked at a picture of a Park Warden during Remembrance Day and his dress uniform is totally different. On the right breast pocket of the tunic is a Parks Canada logo embroidered on. As well the tunic has no epaulet shoulder tabs nor is their a lanyard around the shoulder. I wonder if the one without the same brown belt is a more recent version of the uniform. Abandoning it would seem to go with recent trend in many organisation. The picture I posted was from Remembrance day 2012 and that is what the drees uniform looked like. It has changed. The picture marcpasquin posted is the up to date dress uniform one of the wardens here in town wore his dress uniform on Canada Day and he wore the one marcpasquin posted. Personally I like the new look.